Techshout.com reports that a new, deceptive Trojan Horse program has surfaced. 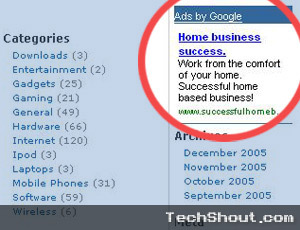 The program is engineered to produce fake Google ads that are formatted to look like legitimate ones. The working of the Ad has a specific procedure. Wherein when the ad is clicked it forwards the user to 3 different sites one after another. What follows next is that the user finally lands himself to a page having a bevy of ads and links to more ads. Through this malicious program advertisers and publishers are the ones who are being deprived of their revenue. “There is a bug in the Trojan Horse which converts Google and Firefox referral graphic buttons into text links. Contrary to the normal Google ads, which have some correlation to the content on the web page, these malicious ads had no content that was remotely similar to the pages to which they had been attached, ” said Raoul Bangera. It has been further noticed that the Google AdLink Ads remain unaffected. The Adsense Trojan Horse attacks small publishers. The premium publishers and ads displayed by Google’s websites are apparently unaffected. This is not the first time Google Adsense has been hit. In January 2005, Google took immediate action and removed some ads that caused malicious code to be installed on visitor’s computers. With the speed and promptness with which Google is working at this hour to fix up the vulnerability, Bangera says that he is absolutely confident that within no time the problem would be resolved.